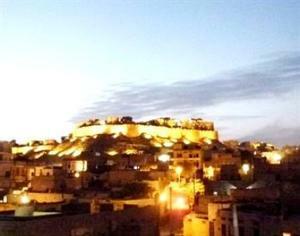 A 2-minute walk to the local market, Mystic Jaisalmer provides a rooftop restaurant with views of the Golden Fort. Guests can arrange for camel safaris and desert meditation trips. Free wired internet is provided in the lobby. The air-conditioned rooms include locally crafted furniture, towels and tea/coffee making facilities. Some rooms have a TV. Private bathrooms have a shower. Overlooking Jaisalmer City, Mystic Jaisalmer is a 3-minute drive from Gadisar Lake and a 5-minute drive from Jaisalmer Railway Station. Free parking is provided. Guests can take part in yoga classes, enjoy an Ayurvedic massage or dance around the evening campfires. Car rentals and a 24-hour front desk are also available. La Mystica Restaurant serves traditional Indian dishes, as well as Italian cuisine. Free! One further child under 5 years stays free of charge when using existing beds. One further older child or adult is charged INR 150 per night and person in an extra bed. Maximum capacity of extra beds in a room is 1. There is no capacity for cots in the room. Supplements will not be calculated automatically in the total costs and have to be paid separately in the hotel.